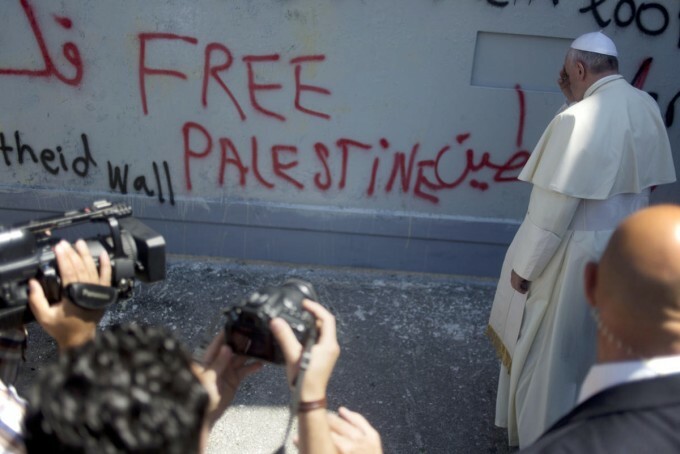 The Pope in the Holy land …. The Pope’s visit to the Holy land . As much as there is something uniquely special about the Pope Francis , kindness and modesty . Virtues that seem to be abandoned from today’s life . Managing to manoeuvre around the security and the program and forcing his way to the WALL is by itself an accomplishment . Many high level officials managed not to see the Wall; not long ago , by Berlusconi’s famous : ” which wall? ” when asked about the wall. The Pope found his way to the Wall , depute the israelis attempt t o beautify it and paint it with white!!! But how muh can occupation extends its fierce coercion .. At the end , we sleep behind that Wall each night and we can succeed in writing on it at least our own messages to the world , and to the Pope . In what seemed a historical moment ,probably for the Pope himself , I hope he managed to notice , the presence of police not people in Jerusalem . I hope he had notices that Jerusalem was a city of ghosts , surrounded with machine guns for his Holyness visit. It could be another major visit , we could hope again for a miracle, maybe now by the closest human to the divine in some of our Beliefs . Maybe his words are really closest to be heard … from God and from the World . As we still aspire for real peace..